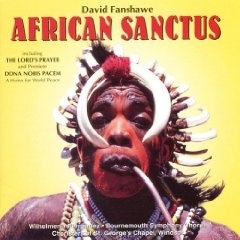 The CD, African Sanctus, is a multicultural celebration of faith by British composer, David Fanshawe. Music in the album blends the Kyrie from the Christian Mass and the Muslim Call to Prayer. Fanshawe recorded the call to prayer in Cairo in 1969. He wrote that its fusion with the Kyrie represents the essential harmonies that exist between Islam and Christianity.